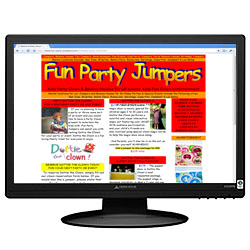 Fun Party Jumpers and Magic Shows is a treat for everybody. Fun Party Jumpers and magic Shows offers Dottie the Clown, a Bay area superstar Magician. Dottie the Clown’s unique magic show will have you and your guest talking about it for weeks. She’s superb and delightful, and offers mysterious fun for everyone. Dottie the Clown also does puppet show, balloon twisting and face painting. Dottie the Clown is in High Demand, so don’t delay, and reserve Dottie TODAY. Call (408)726-8591 to reserve now. Serving: Located in Cedar Rapids and serving all of Iowa and beyond. The Magic of Tim Stolba has been captivating audiences since 1979. 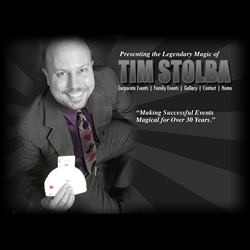 Magician Tim Stolba is available for your special event occasion – across Iowa and beyond. 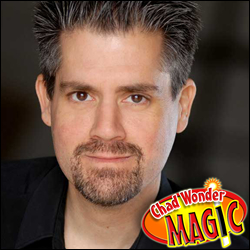 Performing stage, close-up, and illusion wonder, Tim has the experience of hundreds of corporate Performances, family, wedding, and private parties, Church and school shows, and more. Book Magician Tim Stolba today! Serving: Chicago – Illinois and the surrounding areas. 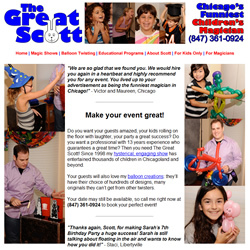 The Great Scott is a professional magician and balloon twisting artist serving the greater Chicagoland area and beyond. Amazing with kids, The Great Scott will leave your youngsters and party goers with belly-aches of laughter. Don’t miss the opportunity to book one of the funniest professional childrens entertainers around – Contact The Great Scott today or visit his website for more information. Magician Matias has an Interactive Magic and Comedy Show, a Unique experience where the spectator is the main actor. He has been performing for the last 13 years, and after studied magic (including Magic Theory, Promotional Magic, Kids Magic and Communication Skills), he developed different routines amazing adults and children in his corporates shows, adult parties and children shows. In addition, because of his knowledge in the area of marketing and business, he can adapt his routines to the demands of his clients, creating special-custom shows, where magic is used as an entertainment tool as well as a communication tool, creating an emotional connection with his customers and their clients/providers. Also he is the first Chilean Magician to write a Kids Show Magic Book for Magicians and gives lectures regarding this topic to Magicians in Chile (and coming soon USA). Mike Ching is a renowned professional magician who has been performing his art since the age of 6! Mike takes pride in each and every presentation, and has been highly respected across the magic industry for many years. Don’t miss the chance to book this award-winning entertainer – Mike Ching Magic is always in demand and desirable dates are often booked many months in advance. Make your special event one to always remember and call Mike Ching Magic today! 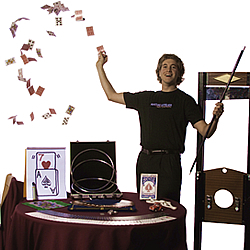 Turley the Magician is a renowned professional magician serving the Washington DC metro area and beyond. With a top-selling childrens book, several national television appearances, and many performances for America’s leaders in the DC area and surrounding (including several at the White House), Turley the Magician can appear for your next birthday celebration, graduation party, Bar/Bat Mitzvah, and more! Don’t miss the chance to bring Turley to your school assembly or other special occasion event, Call today! 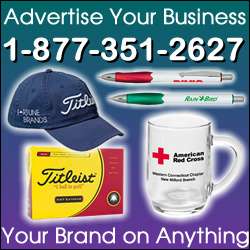 Serving: New England – NH – New Hampshire and beyond. Jason Purdy is a professional entertainer who has mesmerized captivated audiences throughout the United States. Bringing comedy magic combined with music and illusions, Jason performs at a wide variety of venues and events including: college events, corporate gatherings, schools, festivals and fairs, hospitals, conventions, and private events such as parties and special occasion get-togethers. Call or visit the website today to find out more info on professional Magician and Illusionist Jason Purdy. Rick Silver is a professional magician performing in the greater Atalanta Georgia area and beyond. Rick has tailored a number of his performances for a variety of event types including: Parties, Corporate Gatherings, Close-in Shows, Platform and Stage Shows, Illusion performances, and more. With magic for all ages, Rick Silver will deliver your audience into the realm of the impossible – contact him today or visit the website for more information.